The Genesis Oceanic Cover Rim Clamp is designed to assist the technician in removing second stage diaphragm retaining rims that can not be normally removed by hand. The clamp is machined with two different size internal ledges to fit all Genesis GS2000, Atlas, Octupus and Oceanic Gamma 2, Explorer, and GT second stages. The ledges are sized to fit the rims exactly to help prevent rim distortion during removal. After the rim has been installed into the clamp, the clamp can be "squeezed gently" in a bench vise to keep the rim from slipping while it is removed. 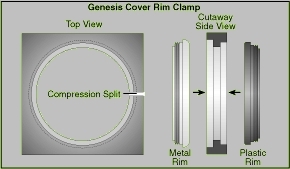 The Genesis Oceanic Cover Rim Clamp is machined from aluminum bar stock and vibratory finished to remove all burrs.